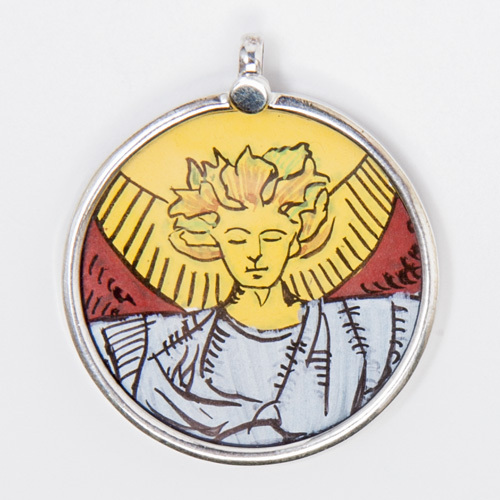 This beautiful pendant of a detail from THE WHEEL OF FORTUNE Tarot card, is hand-painted and set in sterling silver with a glass cover protecting the painting. 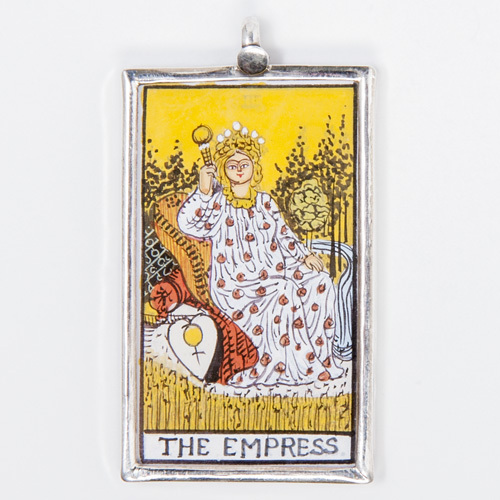 It is stamped 92.5 for sterling silver on the back, and measures 3 cm across (approx 1 ¼ inch). 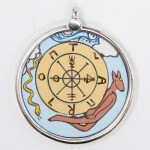 Wearing this pendant will help you to go with the flow, to ride the energy around you without trying to control it, to trust that you are part of a grander scheme of things. 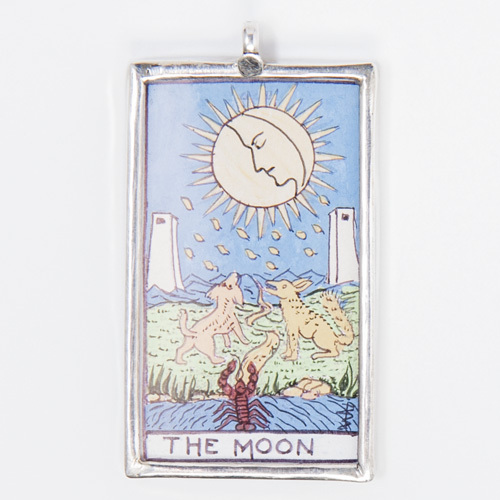 And, it may bring you some luck! 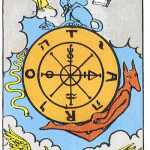 In this detail from the Wheel of Fortune card, we see the mysterious Wheel itself. 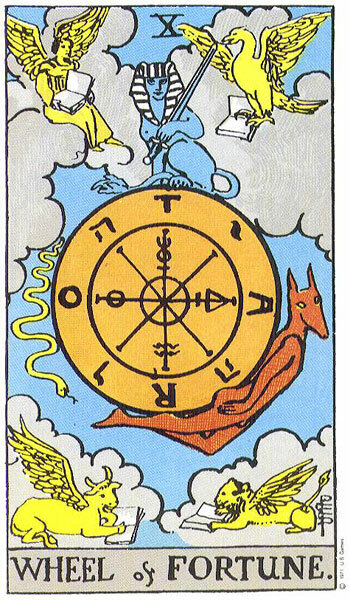 The Wheel is inscribed with the symbols of the four elements (air, fire, water and earth), and the Y-H-V-H, the tetragrammaton, the unutterable name of God. We also see the figure of Anubis, the Egyptian god who guides souls to the Afterlife, and the Latin letters T-A-R-O. 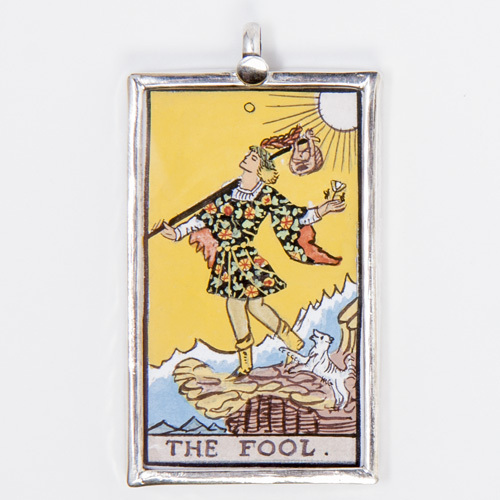 When the Wheel of Fortune card appears in a Tarot reading, we are reminded that the only constant in life is CHANGE, and we think of the law of karma, what goes around comes around. And, there is a feeling of LUCK. Life is change, ride the wheel…sometimes you’re up, sometimes you’re down… if you’re down now, there’s nowhere to go but up. If you’re facing a challenge, look for the bigger picture and have faith that things will flow as they should. 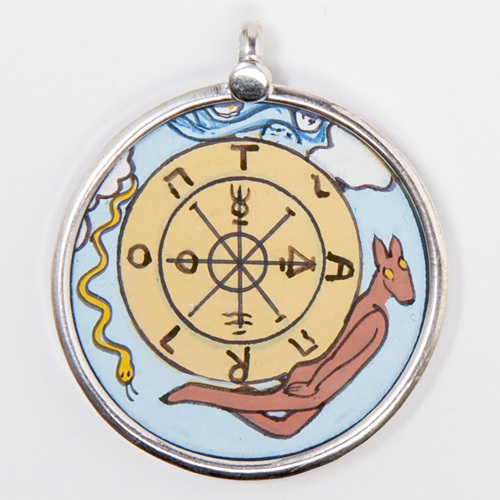 Be the first to review “Wheel of Fortune Hand-Painted Pendant” Click here to cancel reply.